Frog? offers innovative mineral technology for pool & spa care that is EPA registered to destroy bacteria which SAVES 50% on chlorine or bromine use for softer water that leaves a crystal clear shine and is easier on equipment and surfaces. In addition Frog? offers repeat sales of multiple products every year for a strong aftermarket business.Includes a POOL FROG? Cycler 5400 and Mineral Reservoir Series 5400. 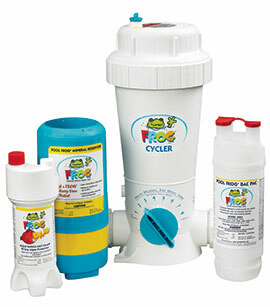 Cycler is in-line with 2″ male adapters installed for pools up to 40,000 gallons. Ports for pools up to 25,000 gallons. Includes instruction manual, video on CD-ROM, and consumer coupon for a FREE bottle of FROG BAM.? Do not install off-line. Mineral Reservoir lasts 6 months.